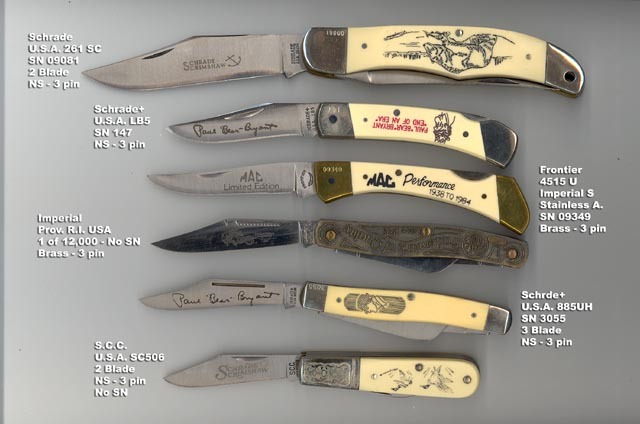 Discussion in 'Schrade Knives Collectors Forum' started by Codger_64, Feb 25, 2007. 3. AY81596 - three pin, MAC etch. None with serial numbers here. I feel like I'm missing out. I assure you, with three nice LB7 variants, you are not missing out! Every little bit helps with this too, even the ones with no serials. Can you post a pic of the four pin? I've only seen the delrin four pins with no serials until now. It's a little hard to tell from the photo but these each have a very different grind on the blades. I really need to invest in a flat bed scanner one of these days. The four pin came from Andy at Sportsnuts. I think he had alot of stuff from the factory clean out, so no telling for sure of it's history. Here's a 4 pin and a 3 pin. I don't have any numbers on them and not sure how to find them. the number if it has one should be on the underside of the right front bolster. 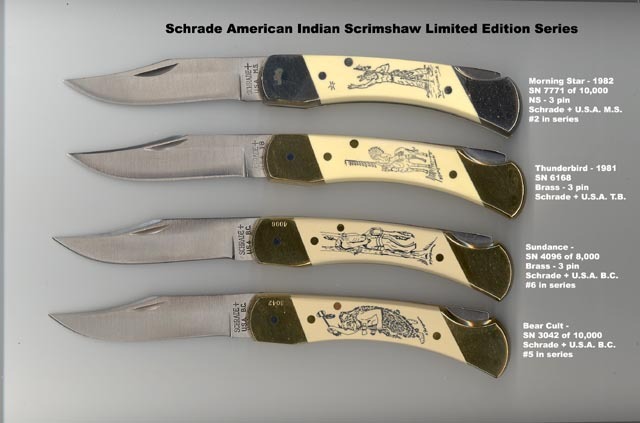 Most SFO's and limited editions would not have serial numbers, unless stamped on the mark (nail nick) side of the bolster. 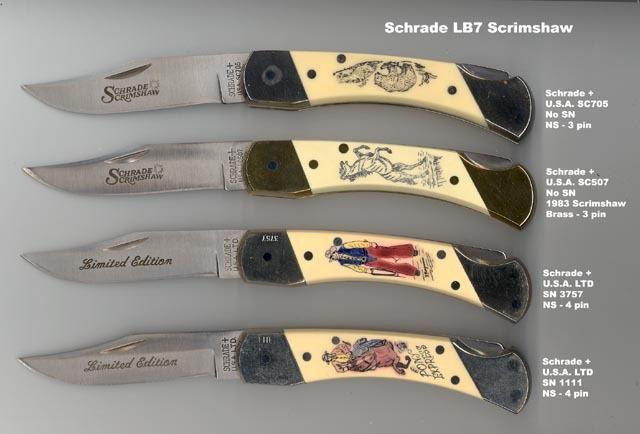 Serialized production LB7s had them on the edge of that bolster per the picture below. This is my earliest one, the 326th one made in 1977. This is an LB7NS SFO. Thanks guys! No, the 'production scrims' won't usually have serials unless they were originally part of a set, in which case they should all have matching numbers. They did also sell many of them as singles. Here is a typical single Scrimshaw Of The Great American Outdoors box. Here are a few that may help. Codger with regards to your quest, I had to bug my boys to whip out their LB-7's bad boys for examination. 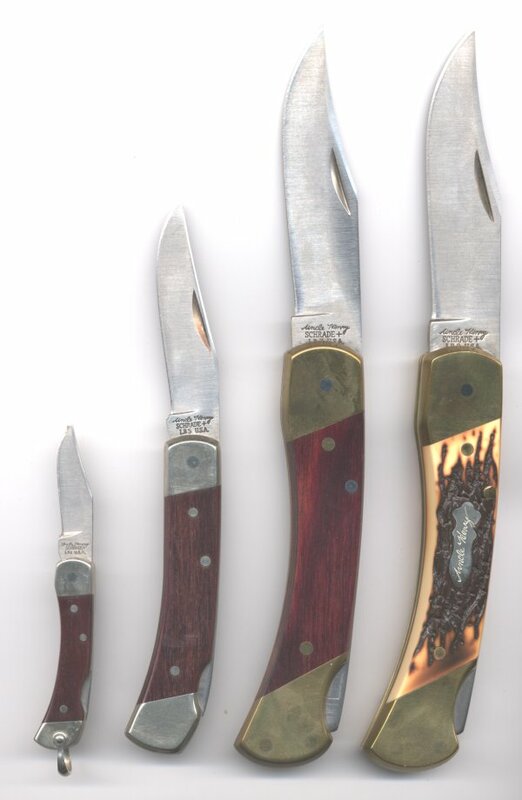 Codger, My Serial Numbered Knives as requested. Is it possible to post that 4 pin LB 7 photo for me to support.Thanks. Codger those 2 Customs photos I sent are both bolster numbered as well, do you wish to post as well? First serial numbers were four place digits. I have 0326, so there is a 0001 out there, possibly a 0000, and a 9999. Serials up to 17693 were produced in 1977. Serial numbers 17694 - 334585 were produced in 1978 when 316,892 LB7's were made. Serial numbers 334586 - 785250 were produced in 1979 when 450,665 LB7's were made. Highest all numeric would be six places, 999999. I have recorded serial number 914569. Thus the first million knives had no alphas. This point was reached some time in 1980. A total of 1,106,906 LB7's had been produced by the end of that year. 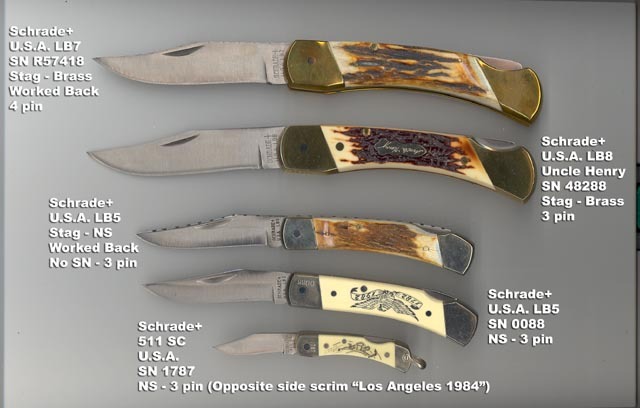 When the single alphas were added, the serials still kept to six places max, so only 99,999 knives were made of each alpha. Lowest alpha recorded so far is A25594. When the rotation went to double alphas, the serials went to seven places. I've recorded BB56630 as the highest double alpha. Some time after this, the serialization ended. Thanks Codger, I found 2 more I was about to post and one is higher than your BB post. Schrade + 4 pin 742181. Hollow. I have three LB7's. 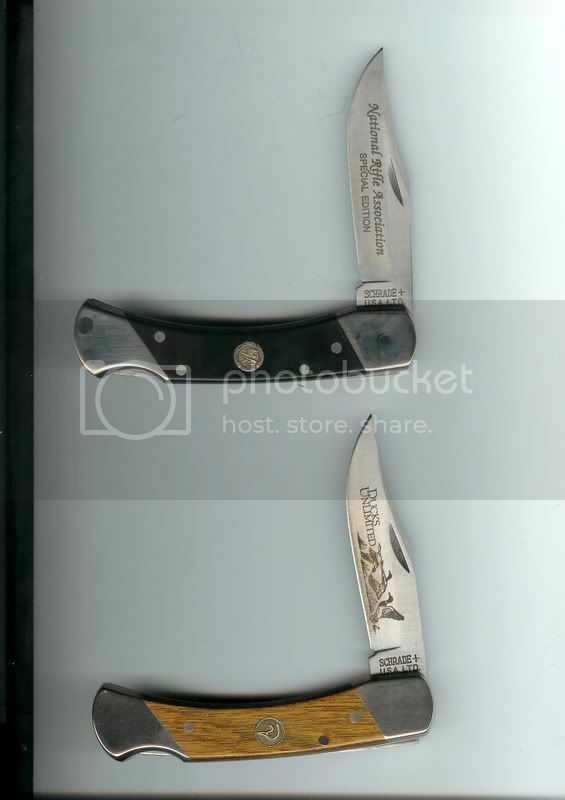 The first is my user/every seasn 4 pin schrade+ with a s/n of c28691. Second is schrade+, no s/n, 3 pin, grey/black box and last 3pin, schrade+, no s/n and a blue/grey box.